This 24-hour influenza preparedness kit can help protect you and your loved ones in the event of a flu pandemic. This kit includes items based on recommendations by the Center for Disease Control (CDC) and World Health Organization and (WHO). 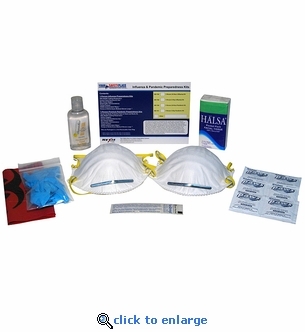 This flu kit includes all the basics to protect you from airborne viruses whether you are caring for a family member or there is a pandemic outbreak in your community. ** Items expire 5.0 years from the date of manufacture.